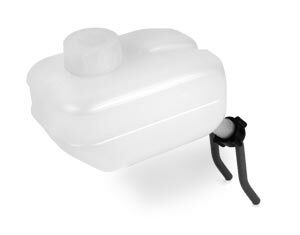 Description: BRAKE FLUID RESERVOIR, 1967 Bug, includes vented cap, metal line outlets and fittings, made by Wolfsburg West. Also fits 1966 and earlier Beetles when converting to dual circuit brakes. A bracket will need to be fabricated in order to mount reservoir.